The East Jeddore School opened in 1921, or possibly earlier, and operated until 1962, at which time it was amalgamated into the newly built Jeddore Lakeville School. Records were acquired at some point by Helen Jennex, and were kept in a trunk with other material at Jennex’s residence until sometime after her death in 1986 when her son Otis Jennex Jr. gave the material to Lake Charlotte Area Heritage Society member Ford Webber. Webber kept the material in a shed until it was transferred to the Eastern Shore Archives in 2007. 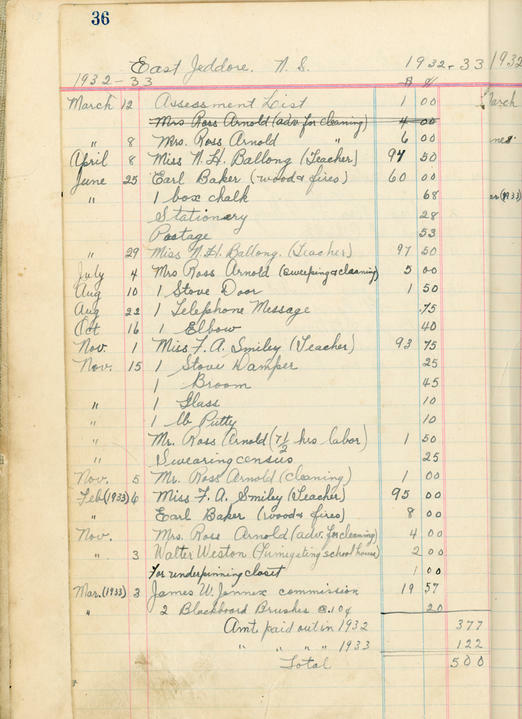 Fonds consists of records of the East Jeddore School and consists of a ledger which records school taxes owed by individual taxpayers for the period of 1930-1936, along with their payment status. Also recorded are teacher salaries, supply costs, insurance fees, and other expenses for the same period. In addition, the ledger book includes minutes of school meetings from 1923-1935. Also includes a sheet of paper which records valuations of taxpayers’ property in East Jeddore and school taxes for 1921. Donated by Ford Webber in 2007. East Jeddore School registers for the years 1933 and 1935-1961 can be found in the Halifax Regional School Board fonds.